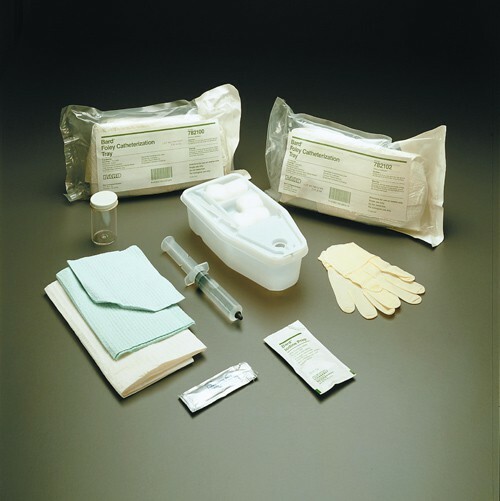 Sterile Contents: pre-filled syringe with sterile water, 5 rayon balls, 2 oz specimen container and label, PVP solution, plastic forceps, latex gloves, syringe, drape and underpad. Please be advised there is a mistake in the writeup for this product No. 782100. this change must have taken place since the last writeup. There is only one syringe, it has 10 mL of sterile water to inflate the catheter bulb. There is not a second syringe with lubricant inside which would be the need for a prescription. As shown in the picture there is only one syringe and one small silver packet of lubricant. I ordered four of these kits and there was only one syringe with water. If you would read the contents on the outside of the package there is only one syringe with water. I reported this to vitality medical two times! Found the product I needed, Got it timely. Super product and super service. Will see you again when needed. Thanks! What is a Foley Catheter Universal Insertion Tray? My doctor advised me to buy these products. They have sterile components including pre-filled syringe with sterile water, 5 rayon balls, 2 oz specimen container. There is an availability of other components like PVP solution, plastic forceps and gloves, 5 gm lubricant in syringe, drape and under pad. This combination of sterile products is ideal for medical setup.